Congratulations, you’re having a baby! Whether this baby is your first, third or fifth, this is no doubt an exciting time for you and your family. Truthfully, newborn sessions are my favorite! There is nothing like their sweet scent and flaky, new skin. 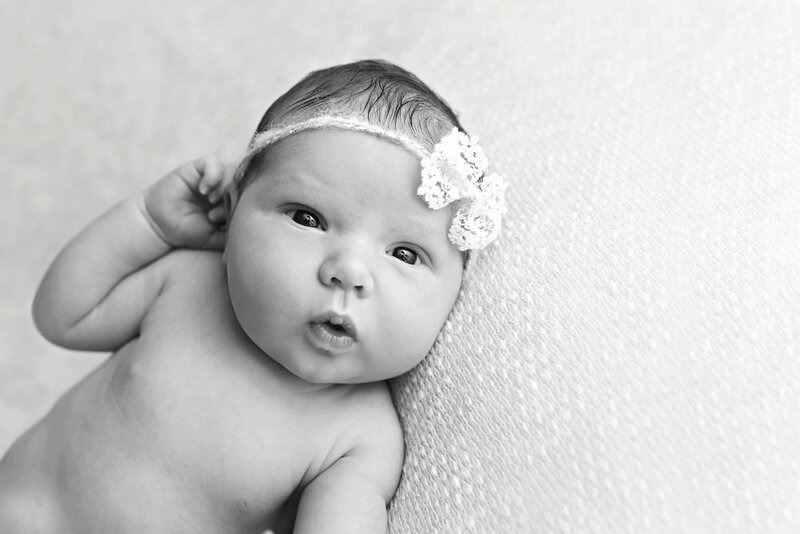 Newborn photography requires a large amont of planning and an insane amount of patience. You’ll be happy to know I’ve got you covered! I truly love everything about motherhood and newborns. Rest easy knowing that I’m going to treat your baby like my own. I put my heart and soul into these sessions and I cannot thank you enough for trusting your newest family member to me. 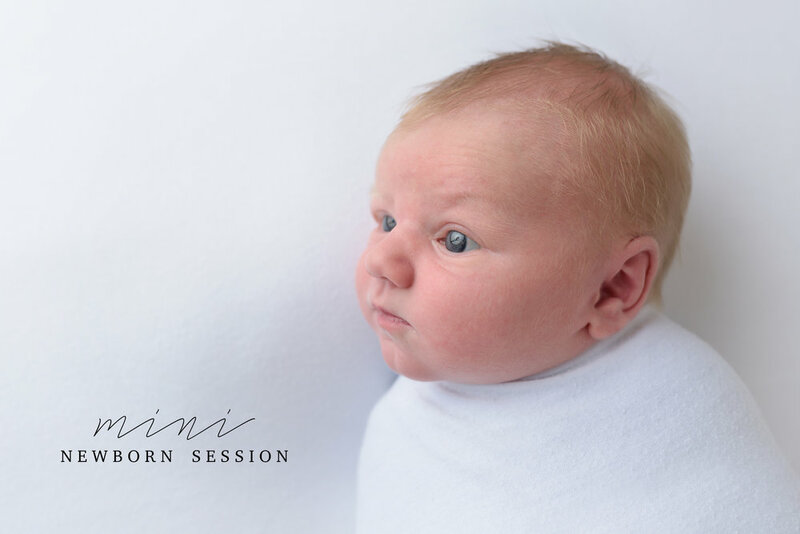 A mini session is a great way for families to get a few great pictures of their newest family member. A full session includes three sections: family, beanbag posing, and props. During a mini session, we pick two of the three sections and work to get as much variety as possible during the 60 minutes. I started my business after my oldest son was born. Because it was important to me to do something that I love that also allowed me to maximize time with my boys, I decided to keep my studio in my home. You are more than welcome to park out front on the street during your session. I like to keep colors neutral and textures simple. I want to create images you’ll love today, but will also love twenty years from now. Because of that, you’ll see a lot of naked babies on white blankets. I tend to shy away from crocheted outfits and oversized headbands. Simple and timeless speaks to my soul. I have a closet full of wraps, blankets, bonnets and headbands. When you arrive at my studio we will pick your favorites to include in your session. If we are going to photograph parents and/or siblings, I recommend wearing light colors. Whites, grays and pale colors are my personal favorite. Keep clothes easy - cotton instead of silk. Siblings look great in jeans or dresses. You are more than welcome to bring a few options so I can help you decide. You do not need to bring anything for baby to wear (unless you'd like to include some simple white onesie images). Moms - if you normally wear makeup, I'd recommend applying it a tad thicker than normal. Also, don't forget a light lipstick or chapstick. If you are formula feeding, bring extra formula. If you are nursing, come prepared to possibly cluster feed. If your baby takes a paci (or if they don’t, but you’re not opposed to one), please bring one. You can bring one special item from home to include in your session. I recommend a personal blanket. A change of clothes (at least a top) for mom and/or dad in the event of an accident. Your newborn just spent nine months in a dark, warm womb. I keep my studio dark and warm. Like really warm. I recommend bringing water and dressing in layers. Also, you might want to warn dad that it's going to be warm. Ideally, your baby is fed, changed and sleepy to start the session. I am a firm believer that sleep promotes sleep. Do not feel the need to keep your baby awake or stimulated before the session. If you live close by, I recommend feeding the baby right before you leave. If not, you may feed as soon as you arrive in the studio. Please dress your baby in a zipper or button sleeper. Pulling clothes over baby’s head could cause them to wake up and/or become fussy. Leave your baby in their carseat to bring them in. If they are sleeping, I will remove them from the carseat and immediatly start the session. If we are including family, we will start with those images. Because I like to keep my studio calm (and sessions can become boring), please plan to take your kids to do something fun while we complete the rest of the session. There is a playground and park walking distance from my home studio. While I have a plan for the session, your newborn will set the pace. Sometimes we spend a majority of the session feeding and soothing while other babies come in ready to go. Every baby is different so we will work with their needs. The mini session is about 60 minutes. I will start with your most important pictures and get as much variety as time permits. Because we are trying to limit the number of times we move baby, I will take the lead soothing your baby. Your baby will be naked for the majority of the session. Messes are totally fine and completely normal. Because wipes tend to make baby fussy, I will use soft tissues. In keeping with my natural style, I only make minor changes during post processing. I will clean up blotchy skin and baby acne. I will also clean up distracting flaky skin, but I think that is what makes a newborn a newborn so I do keep most of it. If your child has an angel kiss/stork bite or Mongolian spots, let me know if you’d like me to lighten them during post processing. I’ll go through and touch up the best images from your session. Within two weeks of your session, you’ll receive an online proof gallery where you can pick your favorite images. 10 are included in your session and you can purchase additional images if you'd like. I hope this packet leaves you informed and excited about your newborn session! If you have any questions, feel free to send them my way. I want this to be a relaxing experience for you so all you need to do is show up and I’ll handle the rest! I’m so excited to meet your newest family member!